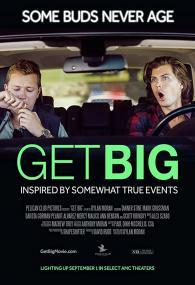 Inspired by somewhat true events, "Get Big" follows the misadventures of two friends as they reconnect to attend a high school classmate's wedding. Alec is the charming troublemaker, while Nate provides the neurotic and awkward foil to his friend's unpredictable antics. "Get Big" takes place over the course of a crazy 24-hour period during which Alec and Nate cross paths with oddball cops, curmudgeonly neighbors, drug dealers, psychopaths, escorts and pretty girls, all while the clock ticks down their classmate's big moment.